The health benefits of almonds include having the most nut protein of any other nut. And the benefit of Spanish almonds is a much softer and buttery tasting almond compared to its California relative. Pistachios come in second to almonds with its nut protein content. The health benefits of pistachios include being a more digestible nut along with promoting the growth of beneficial bacteria in the digestive tract. 1 oz. serving gives you 6 grams of nut protein. Monounsaturated fats are the primary fat found in almonds and they are an exceptional source of vitamin E.
Almonds are a good source of magnesium, calcium, iron, copper, and manganese. And almonds are a low carb food with a good amount of fiber. The many health benefits of almonds include lowering blood pressure, controlling blood sugar, and lowering "bad" cholesterol. The health benefits of almonds also includes being rich in antioxidants. The skin of almonds are rich in polyphenol antioxidants which prevent oxidation of cholesterol. Are Almonds a True Nut? 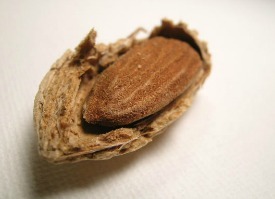 Almonds are not true nuts and are actually the seed from the fruit of an almond tree. Almonds are actually the pits of these fruits. Almonds are native to Middle Eastern countries and have become a huge monoculture crop of California. We recently drove through a part of California where miles and miles of these trees are planted. The air quality was so toxic, that I couldn't wait to get to a big city where the air quality is not great - LOL! Did you know that all almonds commercially grown in California or in the U.S.A. are now being pasteurized or irradiated? That means that their nutrients have been compromised!!! This type of monoculture practice will not produce the healthiest almonds and you may want to look into finding the Spanish almonds. Spanish almonds also called Marcona almonds are pretty different from the domestically grown American almonds. It looks like Spanish almonds are the closest you will get to the original or heirloom type of almond. Spanish almonds are rounder, softer, and more buttery than their California almond relatives. The health benefits of Spanish almonds include being equally rich in protein, heart healthy fats, and minerals. However, Marcona almonds are sweeter, higher in antioxidants, and have a much stronger almond flavor compared to the American hybridized version. Spanish almonds are known for their excellent cultivation processes. Also, European regulations do not require almonds to be pasteurized, so Spanish almonds will retain their antioxidant properties. Pistachios are in second place to almonds when it comes to nut protein content. And a 1 oz. serving of pistachios will give you 5.8 grams of protein. Pistachios are less consumed even though they are a very ancient edible nut. Similar to almonds - pistachios are not a true nut. They are a seed that comes from a fruit or drupe that originates from the Middle East and Central Asia. And pistachios will have a higher concentration of amino acids than any other nut. Pistachios are a great source of L-arginine which converts into nitric oxide in your body. Also, the high amount of vitamin B6 found in pistachios helps to build amino acids essential to transmitting nerve impulses in your body. Pistachios are lower in calories. The fat content of pistachios is lower compared to many other nuts. However, pistachios are composed primarily of oleic acids which are heart friendly monounsaturated fats. And pistachios are also an excellent source of vitamin E.
Most notably, pistachios come with a very high amount of potassium! You'll also find copper, iron, zinc, phosphorus, calcium, magnesium, manganese, and selenium in pistachios. And because pistachios have a high copper content, this helps with the higher absorption of iron. Also, phytic acid is a lot lower than the high amount of phytic acid found in almonds which means better mineral absorption. Next to macadamia nuts, pistachios contain the least amount of phytic acid. And you may be able to get away from having to soak these nuts. Pistachios are known to contain aphrodisiac properties, grow lush hair, promote skin health, and are also known to reduce macular degeneration because they contain potent antioxidants. To get the most health benefits of pistachios, buy organic pistachios that are fresh! Among the health benefits of almonds and the health benefits of pistachios is that they both contain a little Omega 3 fatty acids, but they both contain a pretty high amount of Omega 6. This means that both nuts can be eaten in moderation, but should not be the mainstay of your diet. And remember to experience the health benefits of almonds, these nuts will have to be properly soaked and prepared to deactivate its numerous anti-nutrients. 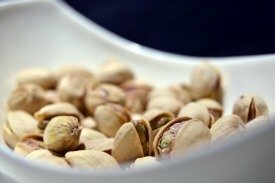 The health benefits of pistachios may be more accessible because it appears to contain a lot less anti-nutrients than almonds. However, keep in mind both almonds and pistachios will not give you complete proteins. Phytic acid is especially abundant in almonds. Phytic acid binds to important minerals such as magnesium, calcium, copper, and iron in your intestinal tract. This will block their absorption and prevent your body from receiving these minerals. However, one of the biggest obstacles is having high amounts of enzyme inhibitors which prevent your body from accessing nut's proteins. The purpose of phytic acid and enzyme inhibitors are to prevent seeds and nuts from sprouting prematurely. This feature is what helps to store nuts for a pretty long period of time. However, eating nuts that contain these anti-nutrients will lead to mineral deficiencies and digestive distress. Soaking nuts in warm salty water will deactivate these enzyme inhibitors and help to remove phytic acid from nuts. This also starts the sprouting process and enables nut's protein to be available for absorption by your body. Soaking almonds not only increases the protein content, but also increases the amount of B vitamins. Soak your nuts for a period of 7 hours to overnight for the best results and some nuts may need to be soaked for at least 12 hours. Soaking almonds in particular will help you to receive the health benefits of almonds. Soaking pistachios before consuming them may or may not be necessary as pistachios appear to have less anti-nutrients? ?